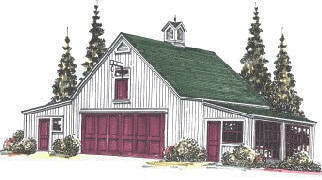 If you enjoy gardening, woodworking or tooling around on an old car or tractor, you'll love this barn. It has a big, bright workshop with doors at back so you can wheel your projects and supplies right in. It has a greenhouse or potting shed with doors for your lawn mower, enough parking space for two cars or small trucks and a convenient storage loft with stairs and an outside hatch. Floor area is 1,144 Sq.Ft. Loft Area is 576 Sq.Ft.